The Great Lakes E-Series GL840E-2436MP is a 44U server rack enclosure with vented top panel. Interior designed for easy 19" EIA rail installation and infinite adjustment. Rails also double as cable management with round cable pass through holes and vertical and horizontal tie down slots. Rails will have RMU markings and standard universal rail will be multi-vendor server compliant. TRC (True Rail Count) rails - This certifies that the number of RMU are true and all accessible within the door opening. 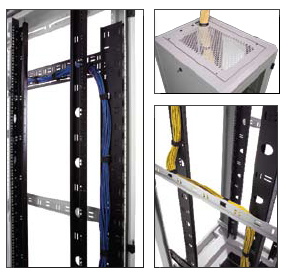 Vertical & horizontal cable management lacing bars that move independently from the mounting rails which removes any size restrictions caused by cable trays. Networking/ganging of enclosures through the corner post, no tools required. This allows you to keep side panels installed when required.